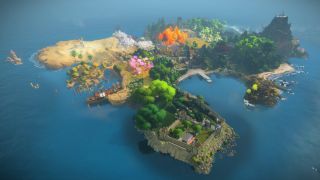 The Witness is a gorgeous new puzzle game from Braid creator Jonathan Blow. It's coming to PC on January 26 2016. We've been looking forward to this one for a long time. At first puzzles have simply have you sketching routes through increasingly complex grids, but The Witness' interlocking puzzles are woven into the landscape. Solved puzzles open doors, uncover cryptic maps and guide you to new areas. There will be hundreds of puzzles to solve. Jonathan Blow gives his completion estimates on the Playstation blog. "There’s a lot here. When we started making this game, I figured it would have between eight and 12 hours of playtime. As it happens, the game we’ve finally built is around 10 times as big as that. If you are a completionist who wants to wring every last drop out of the game, you might expect to play for 80 hours, or possibly 100. For people who don’t want to go quite that far, the game’s still got plenty for you." Get a sense for how they nest with the environment in our hands-on account from earlier this year.